This is the full text of Bishop DiMarzio’s homily delivered on Oct. 27 during the diocesan Marian Pilgrimage to the Basilica of the National Shrine of the Immaculate Conception in Washington, D.C.
Today, we gather at this beautiful basilica, and this is most probably the last pilgrimage here that I make as your diocesan bishop. At the suggestion of Father John O’Connor, Director of the Diocesan Liturgical Office, I will share with you my special devotion to Our Lady under this title of Our Lady of Mt. Carmel, so that you may understand who Mary is under this title. As you know, we venerate Mary in so many different ways under so many different titles because she is so precious to so many people and so many religious orders. For over 850 years now, the Order of Carmel has venerated Mary and worn her Scapular as a sign of their special devotion to and under the protection that Mary offers to them and to all who associate with this particular devotion to Our Lady of Mt. Carmel. In our first reading today we hear about the Prophet Elijah, the prophet of Carmel. In fact, the reading today described Elijah who had climbed to the top of Mt. Carmel after he had performed many miracles, he now seeks God’s help. In the First Book of Kings we hear the story of his triumph over 450 prophets of Baal, who was a pagan god whose worship crept into the culture of the people of God. It happened through the special relationship that Queen Jezebel had with King Ahab who erected a pagan shrine to Baal. The people of Israel were enthralled by these new pagan practices. But Elijah comes onto the scene and he challenges the priests of Baal to a contest, a contest to see whose sacrifice would be consumed by Yahweh, or by the god Baal without any fire. An altar for Yahweh was erected as well as one for Baal. Wood was placed on the stone altars and two young bulls were sacrificed. The prophets of Baal danced around their altar invoking their god to no effect. Elijah taunts them saying that they should cry louder or even slash themselves; but to no avail. He said maybe your God is asleep. And then Elijah called upon the Lord God. He asks that the altar be doused with water seven times. A lightning strike comes from heaven and consumes the sacrifice; the wood placed upon the altar and the altar stones themselves. In retribution, however, the prophets of Baal were slain, all 450 of them. The story does not end here. Elijah then flees for his life to Mt. Horeb since Jezebel was seeking to kill him. He finds himself in a cave and waits for God’s presence to take his life. Elijah prays to God that He will see him – three signs are given to him. Elijah believes that God is coming with the strong wind, and then in an earthquake. But God is in neither. And then comes a tiny whispering sound and it is there in that solitude where Elijah meets God, in that quiet time, which has become for all Carmelites the sign of contemplation; the meeting place for God and His creatures. 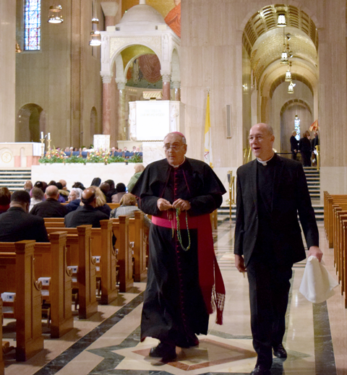 Bishop DiMarzio with the rosary at the diocesan pilgrimage to the Basilica of the National Shrine of the Immaculate Conception in Washington, D.C. This story continues for Elijah, knowing that his death is near, he seeks someone to take over his mission of prophecies. He meets a young man plowing a field whose name is Elisha. Elijah calls to him, however, Elisha asks first to go and bid farewell to his family, but Elijah denies him that opportunity. Elisha must follow immediately, just as one day Christ would say the same thing to one whom he called to follow him. Elijah, however, does not die. In the sight of Elisa, Elijah is taken up into heaven in a fiery chariot, not before he leaves his cloak which just before had been used to part the Jordan River so that he and Elisa could pass over the torrent. Elisa asked for nothing but a double portion of Elijah’s spirit and that is given to him. So too Elisa parts the water of the Jordan with that cloak. That cloak has become for us the Scapular of Our Lady of Mt. Carmel. Her cloak, that cloak of that mantle of motherhood, is given to the Order of Carmel. In the year 1250, Albert, the Bishop of Jerusalem, wrote a rule for the monks of Carmel since they were inhabiting that sacred place. Soon after that time, St. Simon Stock received the revelation from Our Lady of Mt. Carmel that those who wear the Scapular as a habit, as a sign of their baptismal garment, will be delivered speedily from the suffering of purgatory if they wear the Scapular with devotion, live a holy life of purity according to their state in life, and pray to and are devoted to Mary in prayer. Yes, this is the story of Mt. Carmel. But still, who is Mary for us? Our Gospel gives the answer; Mary is our Heavenly Mother. On the cross, Jesus gives to us His last will and testament. All that He had to give to us was Mary. And to John, He entrusts Mary, and in doing that Jesus entrusts His mother to each and every one of us as our mother and intercessor. Saint Thérèse of Lisieux, a Carmelite sister, in her writings about Mary, says, “She is more mother than queen.” Yes, Jesus calls Mary His mother and ours. If we meditate on what mothers do, perhaps we will understand better the role of our devotion to Mary under this title of Our Lady of Mt. Carmel. Mothers clean their children, no matter how difficult it is to do so. They always manage to get their children clean. St. Josemaría Escrivá once said, “There is no child so dirty that its mother cannot make it clean,” referring to Mary. I remember one incident in my life when I was a small child. My little cousin decided to play in the street after the road had been newly paved. She was covered head to toe in tar, and I did not know how her mother would ever get her clean again. Low and behold, after several hours in the tub, with lots of elbow grease and lots of Ajax, my cousin was clean and new again! Yes, it is Mary who invites us to the sacrament of reconciliation so that we too can be clean and new always prepared for eternal life. Mothers are those who heal their children. They stay beside them in times of trouble. Mary teaches us also how we can be healed of spiritual and physical ailments and accepting God’s will as she did, but always recognizing that God’s will must be done. Mary encourages us and helps us to do God’s will. Today in this Eucharist, we pray for the healing of the victim of sexual abuse, especially at the hands of those who represented the Church. And finally, Mothers feed their children. Yes, mothers feed their children the best food that they can. They first feed them with the milk from their breasts to make sure that they will have a healthy life. I once received from a priest traveling back from Poland, a beautiful relief of Mary breastfeeding the infant Jesus. And so too, Mary, Mother of the Eucharist, feeds us with the body and the blood of her Son. As had it not been for her willingness to give her body for the Lord’s conception and birth, we would not have the great Eucharist that is ours. One of our newest saints, St. Paul VI, once said, “We are the children of Adam, having Mary as our sister.” Recognizing Mary’s motherhood and sisterhood is an insight for all of us. The great novelist George Bernanos once said, “Her eyes are eyes of gentle joy, wondering sadness, and with something more in them, something which makes her younger than evil, younger than the race from which she spring: although she is, by grace, Mother of the world, and Mother of grace, she is also our little younger sister.” Yes, my dear brothers and sisters, Mary is the mother and sister to us. We rededicate ourselves to Mary in this beautiful shrine dedicated to her. We seek her intercession to become evangelizers, recognizing that our own conversion is necessary. I invite you to share this message with others, especially those who do not normally practice their faith, especially those who are enthralled by the secular world in which we live. Mary brings us to Jesus. Mary, our sister, and our heavenly mother, will not fail us if we do not fail to continue our devotion to her.